When learning any new reaction, I think you always have to start with the “what”. What bonds are forming, and what bonds are breaking. After you answer “what”, then you can start asking “where” – as in , “where are the electrons of the reactants?” What areas are electron rich? What areas are electron poor? There’s going to be attractive interactions between electron-rich and electron-poor areas. Then, you can use electronegativity and resonance to figure out the potential reactions. But even that only gets you so far. It helps you identify different possibilities for reactions, but doesn’t really help you with getting to the final result. In order to get there, you need to be able to evaluate how, as in “how do the electrons move?”. 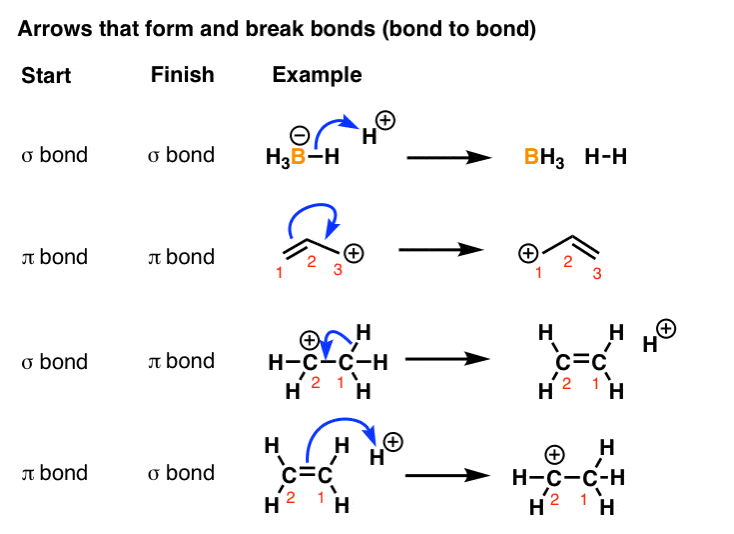 In other words, “in what sequence do these bonds form and break?” And that will open up a new set of questions. So “How do the electrons move?” will be the next question to address here, and it will involve a lot of curved arrows. Because (forgive me for repeating myself), reactions are transactions of electrons between atoms, and curved arrows are the accounting system that let us visualize those transactions. Let’s go a little deeper into the details of that accounting system. Last time I mentioned that there were just three “moves” for drawing arrows (lone pair to bond, bond to lone pair, and bond to bond). However, if you consider that there are two types of bonds (sigma bonds and pi bonds) this gives you different “flavors” within those categories. The source of our electrons here is a lone pair of electrons, and this lone pair is accepted by a second atom. The result is the formation of a bond. The atom that accepts the electrons has its charge become more “negative” by one, and the atom that donates the electrons has its charge more “positive” by one. Again, the formal charge of the atom that accepts the electrons becomes more negative by one, and the formal charge of the atom which loses the electrons becomes more positive by one. The third type of arrows are those which both break and form bonds. We can also break sigma or π bonds to form a new sigma or π bond. Note that in contrast to the first two situations (which involve two atoms), these arrows involve three atoms. The atom in the “middle” sees its charge remain the same, while the atoms on either end see their charges changing by plus or minus one. In trying to evaluate a reaction, we’ll often ask ourselves: how likely is this bond to break, or this bond to form? One pathway to being able to answer this question is to have a good knowledge of experimentally measured bond strengths. And that’s OK, although somewhat limited because bond strengths measure homolytic cleavage, not the heterolytic cleavage we’re talking about here. But there’s a much more powerful way to think about evaluating these “transactions” than simply knowing bond strengths. Note how every single reaction involves changes in electron densities? In the last series, I talked about how to determine the electron densities on different molecules using electronegativity and resonance. Now, I’ll go into more detail about how these electron densities change as bonds are broken and formed – and this will have a huge impact on whether or not a reaction is favorable or not. It’s very useful to understand how likely it is, for example, that an O–H bond will break so that the pair of electrons end up on oxygen as opposed to hydrogen. Or whether it’s more likely that a lone pair of electrons on oxygen or nitrogen are more likely to form a bond with a proton (H+). If you understand the factors that stabilize (and destabilize) negative and positive charge, you will gain a great deal of insight into why (and how!) certain bonds break and form, and others do not. P.S. Today marks the two-year anniversary of this site: Feb 20, 2010, “Orgo Hacks” was born. I think the site got 20 pageviews that month, but it’s grown like a little weed. The first two weeks of Feb 2012 the traffic was greater than that for all of 2010. Thanks to everyone for reading! Th8is looks very useful to anyone teaching or learning organic chemistry. Good move! Congratulations on your anniversary! Just out of curiosity, how many of your blog posts were you ready to write two years ago, and how many have blossomed directly from your tutoring sessions with students? Two years ago I could write for other Ph.D.’s but didn’t have any perspective on what types of roadblocks new students were facing. I think it took 18 months of working 1-on-1 to really be able to start writing posts that were aimed at the level of someone just starting out.